Crazy for First Grade: Guess what?!?! Ahhhhhh!!!! We're super excited about our newest addition!!! 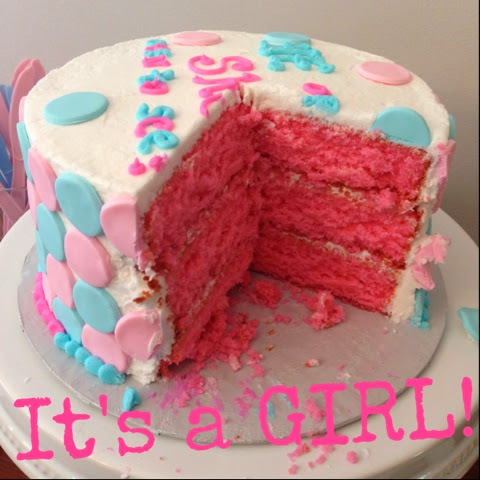 Last weekend, we had our entire family over for a little gender reveal sweetness!! We kept whether we were having a girl or boy a surprise from everyone- even from ourselves for this special occasion! YAYAYAYAY!!! Can't wait to meet our lil' Miss Priss!!! Now that I'm in the 2nd trimester, I'm starting to feel like myself again..less nausea, less long afternoon naps and early bedtimes, more energy, and my favorite...I can drink coffee without getting sick. My hope is to get this blog revived this spring with posts about all the happenings in my crazy first grade classroom! Congrats again Anna!! This is so fun!!! Congrats! Little girl stuff is so cute! Congrats!! Big brothers are awesome! My son loves his little sister!! My kids are about 20 months apart!! How far apart will yours be?!! I hope that you really start to feel better soon!! Congratulations! I love the sweet pictures of your little boy, he looks so proud and happy!